Some solar companies are well positioned for the future, despite near-term challenges. Canadian Solar (NASDAQ:CSIQ) is one of the largest solar panel manufacturers in the world, but it's also one of the riskiest stocks in the industry. The company has built out its capacity by taking on heavy debt, most of it short-term, and is generating very little in the way of profits. If you're looking into the solar industry today, here are some better picks for your portfolio. One of the first things I look at in commodity solar module manufacturers like Canadian Solar and JinkoSolar (NYSE:JKS) is their gross margin. Higher gross margins means lower costs or more pricing power with customers. JinkoSolar's gross margin last quarter was 22.1%, compared to 17.8% at Canadian Solar. 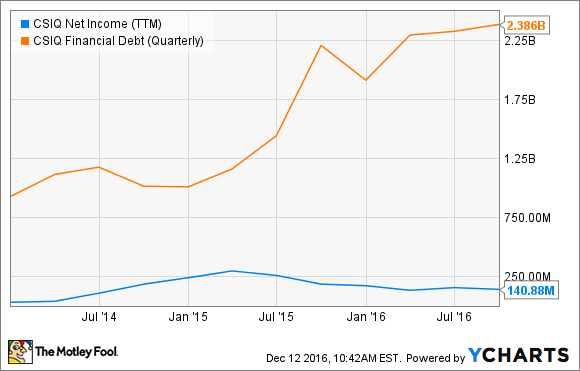 The other advantage the company has is a smaller debt load. There's $1.81 billion of debt outstanding, but that's offset by $1.42 billion in project assets. By contrast, Canadian Solar has $2.39 billion in debt and $1.18 billion in project assets. JinkoSolar is, structurally, extremely similar to Canadian Solar, manufacturing solar modules and building some energy projects. But it has a better balance sheet and better margins, which makes it a better stock for your portfolio as the industry heads into a rough 2017. Some parts of the solar industry are in for a very difficult 2017. Utility scale projects, in particular, are seeing weak demand in the U.S. and China, which were market leaders in 2016. But the residential solar industry continues to grow and that should help Vivint Solar (NYSE:VSLR) long-term. Despite the SunEdison acquisition falling through, Vivint Solar's pace of installations has held fairly steady over the past year at around 59 MW per quarter, and cost per watt hit a record low of $2.85 in Q3 2016. What's encouraging about the residential market is that falling solar panel costs will help drive costs down, and new financing options like loans are opening up new markets and options for customers across the country. Vivint Solar is adapting to the new market conditions, which have been challenging over the past year, but the residential sector has the wind at its back and that'll help the company in 2017 and beyond. One of the longest-lasting solar companies is First Solar (NASDAQ:FSLR), and for good reason. The company has among the lowest costs in the solar industry, and has a great balance sheet as well. Despite its plan to upgrade its products from the Series 4 to Series 6 models next year (entirely skipping the Series 5 module cycle), management still expects earnings to be breakeven to $0.50 per share on a non-GAAP basis. And cash balance at the end of the year is expected to be $1.4 billion to $1.6 billion. If you're worried about the risk in solar companies that have unhealthy balance sheets and are making slim profits, then First Solar is a good alternative. The company has proven the ability to make money, improve its technology over time, and maintain a strong balance sheet. That's a winning formula in the solar energy business.